If you're concerned about vapor intrusion, Indoor Environmental Management can help. Contact us today to learn more about how we can provide you with quality vapor intrusion testing and mitigation. We offer free estimates in Gainesville, Jacksonville, Destin and throughout the surrounding areas. Indoor Environmental Management is proud to be a member of the international National Radon Defense network, which has worked with Environmental Engineering firms all over North America in installing Vapor Intrusion Mitigation Systems. 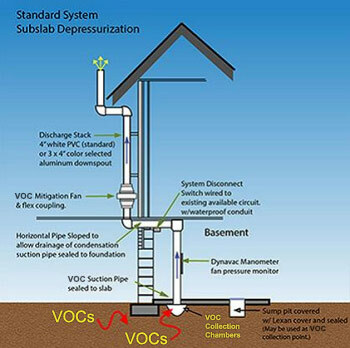 We understand the importance of sealing, depressurizing, and communicating all the entry points of the vapor intrusion. For an environmental cleanup project of this nature, we understand you need a company with experience to get the job done right. We are your trusted local experts for soil vapor extraction and indoor air quality services, so call us today to get started! We offer free estimates in Gainesville, Jacksonville, Destin, Tallahassee, Gainesville, Ocala, Daytona Beach, Panama City, Winter Park and throughout the surrounding areas.